Just to get it out into the open, my political leanings have been described as "left of liberal." That is probably because I find people in the U.S. who self-identify as "liberal" to be a bunch of far-right-wing extremists, and today [2008 through, so far, 2015] we have just such a far-right-wing extremist in the White House. Why support and vote for a candidate of the Democratic Party when all you get anyway is a far-right-wing, Republican-like President, the quintessential "wolf in sheep's clothing"? Why do we have no progressive alternative in this country? Your place for wisdom, humor, irony, and some scary thoughts. "I was going to the worst place in the world, and I didn't even know it yet." "If I owned this place and hell, I'd rent this place out and live in hell." "Major Strasser's been shot: Round up the usual suspects." "Gentlemen! You can't fight in here: This is the War Room!" "I love the smell of napalm in the morning. . . . That smell — that gasoline smell . . . it smells like — Victory. "I wonder what was going through Custer's mind when he realized that he'd led his men into a slaughter?" "The secret of my success: I drink; but I don't drink enough." "In Italy for 30 years under the Borgias they had warfare, terror, murder, and bloodshed, but they produced Michelangelo, Leonardo da Vinci, and the Renaissance. In Switzerland they had brotherly love - they had 500 years of democracy and peace, and what did that produce? The cuckoo clock . . . "
"There are two kinds of men, and only two, and that young man is one kind. He is high-minded. He is pure. He is the kind of man that the world pretends to look up to and in fact despises. He is the kind of man who breeds unhappiness, particularly in women." "Hate can fill the heart as surley as love can." "And the hits just keep on coming." "We lost. We always lose." "Forget it, Jake. It's Chinatown. " "Just one more word. If I ever run into any of you bums on the street corner, just let's pretend we never met before." "It's better to burn out, Than to fade away"
"Let the public be damned"
"[W]hat [i]s good for the country [i]s good for General Motors and vice versa." Secretary of Defense under President Dwight Eisenhower. "In Baxter's view, the care for external goods should only lie on the shoulders of the 'saint like a light cloak, which can be thrown aside at any moment'. But fate decreed that the cloak should become an iron cage." Weber, Max, The Protestant Ethic and the Spirit of Capitalism, trans. Talcott Parsons (NY: Charles Scribner's Sons, l958). "The TV business is uglier than most things. It is normally perceived as some kind of cruel and shallow money trench through the heart of the journalism industry, a long plastic hallway where thieves and pimps run free and good men die like dogs[.]" Hunter S. Thompson, Generation of Swine: Tales of Shame and Degradation in the '80s (New York: Summit Books, 1988), page 43. About horses, death, the human condition, and football. Revelation, Ch. VI, vv. 7-8. "Outlined against a blue, gray October sky the Four Horsemen rode again. In dramatic lore they are known as famine, pestilence, destruction and death. These are only aliases. Their real names are: Stuhldreher, Miller, Crowley and Layden. They formed the crest of the South Bend cyclone before which another fighting Army team was swept over the precipice at the Polo Grounds this afternoon as 55,000 spectators peered down upon the bewildering panorama spread out upon the green plain below." New York Herald-Tribune, 19 October 1924. 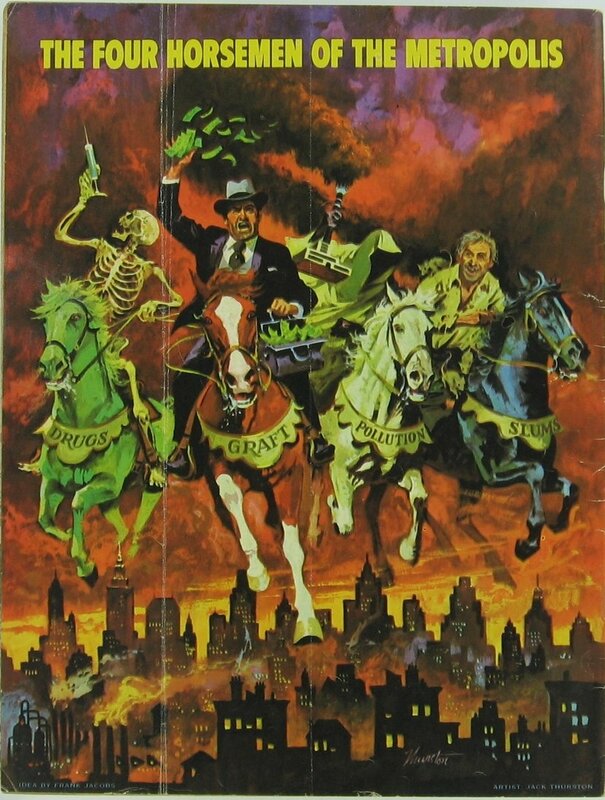 The Four Horsemen of the Metropolis: Drugs, Graft, Pollution, Slums. The aid, care and support of the needy are public concerns and shall be provided by the state and by such of its subdivisions, and in such manner and by such means, as the legislature may from time to time determine. "For all those whose cares have been our concern, the work goes on, the cause endures, the hope still lives, and the dream shall never die." "In the councils of government, we must guard against the acquisition of unwarranted influence, whether sought or unsought, by the military-industrial complex. The potential for the disastrous rise of misplaced power exists and will persist. We must never let the weight of this combination endanger our liberties or democratic processes. We should take nothing for granted. Only an alert and knowledgeable citizenry can compel the proper meshing of the huge industrial and military machinery of defense with our peaceful methods and goals, so that security and liberty may prosper together." (for full transcription see Transcript of President Dwight D. Eisenhower's Farewell Address (1961) (at the National Archives, retrieved 6 December 2012). "[F]ly the thing as far into the crash as possible." "There was always a powerful comfort in knowing he was out there somewhere in the night, roaring drunk, guzzling high-octane whiskey and railing against a world amok with complacency and hypocrisy." "She don't lie; she don't lie; she don't lie: cocaine." "[I]t makes me feel like I'm a man / When I put a spike into my vein[.]" "Could I ram my wango bango into your velvet underground?" "Caedite eos! Novit enim Dominus qui sunt eius!" "Slay them all! God will know his own!" When religion and politics travel in the same cart, the riders believe nothing can stand in their way. Their movement becomes headlong \96 faster and faster and faster. They put aside all thought of obstacles and forget that a precipice does not show itself to the man in a blind rush until it\92s too late. "Over the pope as the expression of the binding claim of ecclesiastical authority there still stands one's own conscience, which must be obeyed before all else, if necessary even againt the requirement of ecclesiastical authority. This emphasis on the individual, whose conscience confronts him with a supreme and ultimate tribunal, and one which in the last resort is beyond the claim of external social groups, even of the official Church, also establishes a principle in opposition to increasing totalitarianism." More wisdom, humor, irony, and scary thoughts. "Why does Marlow keep going up the river, why doesn't he turn back?" "There's a part of him that wants to, Jimmy. A part, deep inside himself that sounds a warning, but there's another part, that needs to know, that needs to defeat the thing which makes him afraid." "I came here to rescue you. We've spent all night looking for you." "So I can kill you myself." The social sciences have too much physics envy -- we can't control our experiments the way physics can, and we should not try to do so, nor should we give the pretense that we can. We need to get away from experimental design and get back to our roots, to real theory and philosophy, and not let ourselves get so abstract that we can't explain what we're thinking about. Puerto Rico's Economy: what is the fix? Comment to the New York Times op-ed piece, "Free Puerto Rico, America's Colony." I agree with everything in this article except for the last paragraph. Puerto Rico is so fundamentaly broken -- and with such long-term consequences -- that rebooting the economy to producing one that works (that is, one that is independently self-sustaining), even with a Phillipines-like transition, is now beyond practical reach. Alternatively, statehood does not fix these types of problems (see Mississippi), and the status-quo is the cause of the problem. A long-term fix of the situation will take decades, and that will best be addressed without the prospect (threat or promise) of independence clouding the underlying economic undertaking. Submitted for the Times Union "Letters to the Editor"
In his April 5 letter, "Allow firearms across state lines," Scott A. Westcott is incorrect that the right to privacy is a "legal fiction" that is "found only in the Constitution's penumbras[.]" The Constitution, in the Ninth Amendment, is quite clearly worded that "The enumeration in the Constitution, of certain rights, shall not be construed to deny or disparage others retained by the people." There is explicitly stated here that there are rights that are not enumerated in the Constitution, but that those rights do exist (e.g., "Natural Rights" as envisioned during the Enlightenment) and are incorporated in the Constitution by this reference, thus, any argument about a right not being protected because "it is not stated in the constitution" is spurious, as "it" is implicitly incorporated here. Further, the Third Amendment, guaranteeing a secure home absent a time of war, taken with the Fourth Amendment, protection from search and seizure, together indicate that there is indeed an absolute incorporated right to physical privacy in the Constitution. Along with the First Amendment, this right to privacy extends to personal thought and action, rights that are therefore equally protected under the Ninth Amendment's explicitly stated incorporation of rights broadly, not just those specifically stated in the Constitution (which directly implies not only the right to gay marriage but also that Roe vs. Wade was correctly decided). This, which I sent to the New York Times as an Op-Ed piece, did not get published, but I believe that the points in it are critical to an understanding of how the principal of federalism should be interpreted. Does anybody outside of the rarified air of the judiciary or of academics even think of this? I'm sorry, but I think not, and that does not speak well of us as a nation. A number of recent Supreme Court decisions have played against a broader tableau than may be obvious to many observers. The hidden victim in the recent Supreme Court decisions on interstate wine sales and medicinal marijuana use is federalism. Once again hung on the cross of the Commerce Clause (Article I, Section 8: "The Congress shall have Power To regulate Commerce . . . among the several States[;]"), the independent and separate discretions of the states have again been abridged by the Federal judiciary. In the case of wine sales, the diminution of federalism was done in the face of the explicit wording of the 21st Amendment (duly noted in the dissent): "The transportation or importation into any State . . . of the United States for delivery or use therein of intoxicating liquors, in violation of the laws thereof, is hereby prohibited." (And this is not to mention the more ephemeral, yet no less legitimate, Tenth Amendment, "The powers not delegated to the United States by the Constitution, nor prohibited by it to the States, are reserved to the States respectively, or to the people.") In the matter of medicinal use of marijuana the argument challenged the court to affirm previous decisions in the past decade that Congress's power to make laws in the name of regulating interstate commerce had become overly intrusive on local governments. Today, the sale of alcohol in and of itself is not troubling in and of itself (it may be to some people, but -- constitutionally -- that battle has already been fought and decidedly lost), while the medicinal use of marijuana is a deeply divisive issue. Nevertheless, the broader issue of the enlargement of the scope of Federal oversight of the states is deeply troubling. 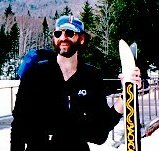 The Teri Schiavo case also -- painfully and, thus, unfortunately -- exposed the debate over the role of the state and federal governments, their rightful places in the lives -- and deaths -- of individuals, and the broader overall debate on the relationship between the various States and Federal government. It was certainly disingenuous for Schiavo's supporters to believe that an increasing conservative Federal judiciary, and especially this Supreme Court, would find grounds to enter the debate. Not only would one expect the court to shun gratuitous oversight of state matters, but also in recent years the Supreme Court has held due process so central to the appellate process that even innocence, even in capital cases, might not be viewed as a sufficient basis for review. (For example, Justice Scalia has written that "The text of the Due Process Clause does not protect individuals against deprivations of liberty simpliciter [i.e., without qualification]. It protects them against deprivations of liberty 'without due process of law.'") Clearly, Terri Schiavo was provided with due process of law, conservative judicial principals were upheld, and the principals of federalism were not violated (and this case was not used as a convenient platform upon which to strike at federalism). But while the Court held fast in supporting federalism in the Schiavo case, just a matter of weeks later we find that same Court has delivered -- twice -- a very different message. This is especially troubling in the manner in which the Court has used a seemingly cafeteria approach to the Constitution: if the 21st Amendment is troubling, then ignore it, and rest one's hat where it is most comfortable. Fifty years ago, when the nation was riven with the spectre of racism, Federal intervention was appropriate, even essential (even to the spectacle of an ostensibly conservative Republican president using Federal troops to enforce a U.S. Supreme Court decision: "Whenever normal agencies prove inadequate to the task and it becomes necessary for the Executive Branch of the Federal Government to use its powers and authority to uphold Federal Courts, the President's responsibility is inescapable"; as President Eisenhower continued, ". . . it would be difficult to exaggerate the harm that is being done to the prestige and influence, and indeed to the safety, of our nation and the world"). A clear and compelling national interest existed for Federal action in what was clearly no longer a State matter. But how often can such a case be made, and even in that case was it really so obvious to all? The point is that we, as a nation, have not entertained a truly informed and critical debate on federalism even as we argue its impact on our day to day lives. While actions may make it obvious ones take on the issue, for example, the majority in the U.S. Senate is clearly opposed to federalism and the independent purview of the various States, those on the federalist side lack a clear constituency and clear advocates, even, now, to the muddled messages sent by the U.S. Supreme Court. The role of the various States was never intended to be that of a convenient administrative sub-unit of a broader national political entity. The relationship between the States and the Federal Government was never intended to be analogous to the relationship between counties and their State governments. The framers of the Constitution made that distinction clear, and subsequent revisions of the Constitution have maintained that distinction. However, in our public discourse we appear to be hedging on that point, if not failing outright to grasp it. The Interstate Commerce Clause was intended, as the court has written, to preclude an unmanageable patchwork of laws effectively confounding trade within the country. However, reasonable accommodations have always been permitted (think of disembarking in Honolulu still carrying a bag of carrots for a snack). Especially when latitude is provided within the Constitution itself, these accommodations are the core of what makes the various States separate and equal entities. To allow this most basic element our Federal structure to be eroded over something as trivial as the trade in wine diminishes us all as citizens, citizens of our country and citizens of our States. This did not get published, but I think it is still a worthwhile piece. On the death of this woman. With the passing of Terri Schiavo, a terribly long, terribly sad chapter in our history comes to an end. While repercussions of the Schiavo case are undoubtedly yet to come, her death brings with it some finality. First of all, the bitter struggle between those purporting to love her most no longer has its central player. To that end, the unfortunately painful debate over the role of the state and federal governments, and the rightful places in the lives -- and deaths -- of individuals, comes, at least in the immediacy of the Schiavo feeding tube, also comes to an end. It was certainly disingenuous for Schiavo's supporters to believe that an increasing conservative Federal judiciary, and especially this Supreme Court, would find grounds to enter the debate. In recent years the Supreme Court has held due process so central to the appellate process that even innocence, even in capital cases, might not be viewed as a sufficient basis for review; for example, Justice Scalia has written that "The text of the Due Process Clause does not protect individuals against deprivations of liberty simpliciter [i.e., without qualification]. It protects them against deprivations of liberty 'without due process of law.'" Clearly, Terri Schiavo was provided with due process of law, and conservative judicial principals were upheld. The motivations of those who advocated on both sides of this issue are less clear than the actions of the judiciary. The Associated Press has reported that "In Rome, Cardinal Jose Saraiva Martins, head of the Vatican's office for sainthood, called the removal of the feeding tube 'an attack against God.'" Clearly, many religious persons would agree; however, even the devout might wonder how engaging in this terrible spectacle could advance any coherent agenda. Alternatively, the Fifth General Assembly of the Pontifical Academy for Life stated that "When a doctor is aware that it is no longer possible to prevent the patient's death and that the only result of intensive medical treatment would be to add suffering to suffering, he must recognize the limits of medical science and of his personal intervention and accept the inevitability and unavoidability of death." Might this not also describe the Schiavo case? Under such circumstances, it is a highly problematic step for the state to intervene and choose sides in this as both a medical and a theological debate. Certainly a vibrant, alert individual who requires a medical assistance to function -- the Pope comes to mind -- is entitled to the most aggressive treatment, but what about those who are indeed at a point of no return? To honor the memory of Terri Schiavo we might best step back from pontificating, from choosing sides, from assuming omniscience, and instead take stock of what we have faced. Apart from fodder for a media feeding frenzy, what do we know now that we did not know before? The death of Terri Schiavo was greatly overshadowed by the death of Pope John Paul II. The pope had a very great devotion to Mary, Christ's mother. The Roman Catholic Church has many prayers devoted to Mary. One that is frequently prayed by the faithful is a three-day prayer. This did not get published, but Dr. Susan Lehrer and I wrote this Letter to the Editor to the New York Times and co-signed it along with Dr. Dorothy Jessup. It concerns an article on Bard College's prison college program at Eastern New York Correctional Facility, which appeared on Sunday, 20 February 2005. Before Pell Grants were denied to inmates in 1994, there were many flourishing educational programs in prisons, as Ian Buruma indicated. We were involved in the SUNY New Paltz College program at Eastern Correctional Facility during that time (1970s-early 90's), and can attest to the significant impact it had on its student inmates and participating faculty. Many of the inmates were unsure of their academic abilities, but all were respectful and enthusiastic students. They participated in class eagerly and perceptively, so prison classes were often more lively and intellectually stimulating than many on-campus classes of that time. The college-level classes changed their own self-perceptions and improved their employability after release. Today, these students, some of whom have earned advanced degrees, are employed in academic, government, and business positions. Much of the credit for the college program at Eastern, then as now, goes to David Miller, then Education Director, and also to SUNY New Paltz Professor Aaron Bindman, who was instrumental in setting up the SUNY New Paltz prison programs. We hope that Buruma's article will help make prison college programs again a part of the options for rehabilitation. If faith based programs are being supported with public funds, we submit that reason-based programs like College also deserve a place. Susan Lehrer, Ph.D., New Paltz, N.Y.
Steve Sconfienza, Ph.D., Albany, N.Y.
Dorothy K. Jessup, Ph.D., New Paltz, N.Y. So, I have been wondering why our letter would not be published, and it occurred to me that it would simply seem so bizarre for such a letter to be signed by three Ph.D.s -- how better to illustrate the cultural divide that was itself a large part of the reason that the programs were lost to begin with. Would it not almost be an example of how out of touch is the academic world from the values of the rest of society? Perhaps we are (Sue, Dorothy, and me), not because we are academics, but because we have these different ideas about what the world should look like. That's not a bad thing, but it certainly leaves us out there, and we become an easy target for criticism from those who want to point and say, "See!" After we submitted the letter I simply presumed it would never be published for just that reason: it would show how marginal the people who support these things really are. Imagine that -- a Ph.D. as a sign of irrelevance!